Do you know what it's fed, or how it lived? We think you should. Our goal is to produce food we feel good about feeding our family and to our customers. Because we believe in a deeper philosophy than “You are what you eat,” but taking it one step farther to, “You are what you eat, eats.” Simply put, we provide our livestock with as much organic natural forage as they would like, and supplement with the highest quality, Non-GMO Project Verified Feed that’s also tested and guaranteed to be free from herbicides, pesticides, and fungicides. Our mission is to produce premium grade, healthy, humanely raised, pasture and free-range based meats. All raised and processed locally, sustainably, and responsibly by healthy farmers, for healthy families. Mimicking Nature. Pigs don’t belong on concrete floors, chickens shouldn’t live in chicken houses, and cows don’t thrive in feed-lots. These environments aren’t natural, and force farms to feed copious amounts of antibiotics due to the constant stress and risk of infection. We allow each and every animal to do what it does best in nature. Cows should only eat grass and natural forage every day. The use of grain in cows has many negative health effects to the animal and their products, be it dairy or meat. Pigs love to root around in the ground looking for roots, grubs, acorns, and other tasty morsels. And, chickens, well, they like to be chickens and eat a balanced diet of fresh forage, insects, and freshly milled or cracked NON-GMO grains. Through the use of electrified netting or wire, our animals have large areas to range freely. Rotational Grazing. 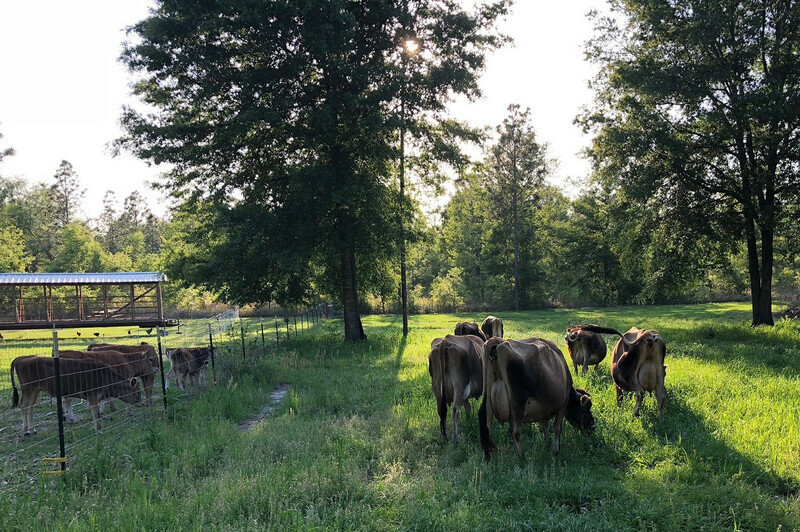 We practice intensive grazing management where all of our animals are moved frequently with electrical fencing and/or netting to promote animal health and stimulate pasture growth while using multiple animal species to create a poly-cultural environment. We do not use any antibiotics, hormones, or chemical wormers on our animals, nor do we use any synthetic fertilizers, herbicides or pesticides on our property – PERIOD. It is our belief, that with patience, proper management, and the repeating pulse of grazing and growth, all of that can be avoided by promoting the health of the animal and the land resulting in untainted food for our livestock, and eventually ourselves. Nutrition and Diets. As eluded to above, our herbivores DO NOT CONSUME GRAIN; However, omnivores like pigs and chickens do. All of our animal feeds are high-quality NON-GMO, fully balanced diets. We hold our feed supplier to the strictest standards, having their grain tested monthly for GMO, herbicide and pesticide residues. This is the major difference between us and most major farms. What animals are fed in most food systems is simply atrocious. How healthy could you honestly be if you ate an animal that has had the equivalent diet of Twinkies and Coca-Cola, and an immune system propped up on steroids and antibiotics to continue to live and grow? Building healthy soils. When we purchased our land we bought classic Florida highland property with highly acidic sandy soil. Our long term goal through our natural farming practices to turn this land into an oasis of fertility. We intend to accomplish this through proper land management by the combined use of pigs for their ability to till, cattle in their ability to stimulate perennial growth through managed grazing, and the natural sanitizing by our flocks of chickens. At no point will we use petroleum-based, synthetic fertilizers, endocrine disrupting herbicides, or beneficial insect destroying pesticides to achieve these goals, opting instead for large scale composting and proper re-mineralization. Sustainability. Lastly, our ultimate goal is to have a truly sustainable farm. That means no input, no feed stores. That’s right – no outside feed inputs. That’s the dream, and this part may be the farthest from our reach. Growing just a little corn is like buying a little combine, and a little silo to store it in. Commodities like corn and soy are produced in large volumes on huge tracts of land, and harvested with half-million dollar machines. All things we do not have… but with planning, partnerships, more experience, and perhaps the entrepreneurial spirit of one of our children, we hope to be able to do all of these things – one day. 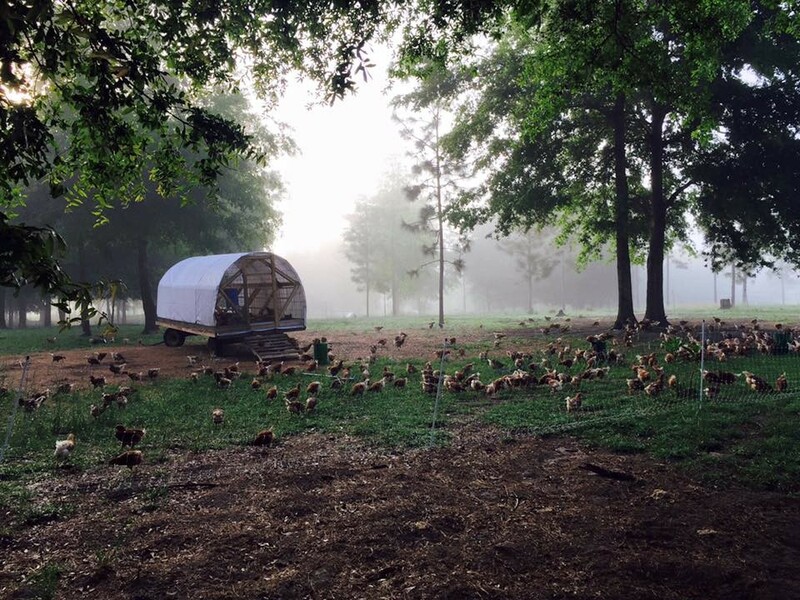 As members of APPPA (American Pastured Poultry Producers Association), we utilize specific farming concepts as it pertains to raising poultry. They have recently produced the following video which does a great job explaining our methods, its benefits, and sustainability. Please take time to watch and share with others!